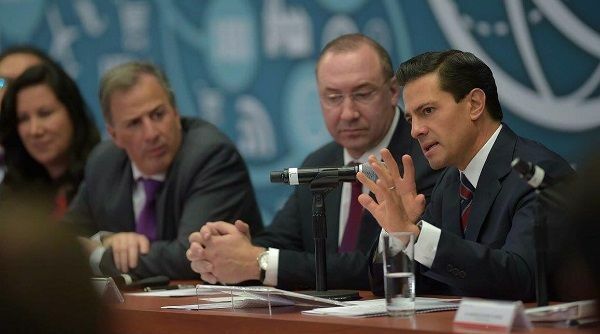 Mexico City – President Enrique Peña Nieto recently met with members of the Global Enterprises Executive Council (CEEG), who presented him with the Agenda Mexico 2030: Proposals for Inclusive growth in response to the Fourth Industrial Revolution. The Agenda contains proposals for achieving economic growth with greater inclusion, and to continue promoting the transformation and welfare of Mexican society. The CEEG brings together 50 multinational firms with a presence in Mexico. Its affiliates provide 500,000 direct and 1.5 million indirect jobs. The government works from the perspective of seeing challenges as great opportunities to continue building. “And with this construction, I invite you to join the important effort so that your businesses will grow and continue to spread throughout Mexico and the world, so that Mexico too, together with them, achieves higher levels of development,” President Peña Nieto said. CEEG president Frédéric Garcia noted that the structural reforms of the current administration have established an open economy, and he reiterated his commitment and confidence in Mexico as an attractive investment destination. • Place Mexico among the world’s top five exporters. • Double per capita GDP and improve distribution. • Increase opportunities for social development by creating one million formal jobs a year. 1. Maintain macro economic stability in a global environment of low growth and uncertainty. 2. Continue implementing structural reforms. Since many of the benefits of reforms will be felt in following administrations, they require continuity and perseverance. 3. Ensure the Rule of Law. Improve public security conditions, strengthen local capacities and the subsidiary support of the Federation. 4. Promote regional development, implement infrastructure projects, and promote Special Economic Zones. Source: Presidency of the Republic Blog, Dec. 19, 2016, translated by MexiData.info.